It was a heart-wrenching incident just waiting to happen. During a circus performance in Moscow, Russia, late last month, a tiger and a lion shocked the audience when they started attacking one another in the ring. 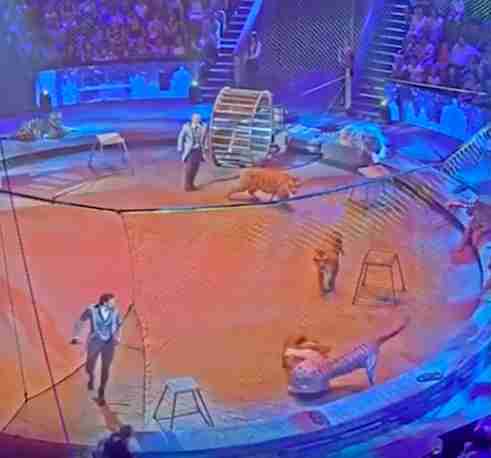 A video of the performance shows a trainer leading a young lion across the ring past a tiger, who was seated at the sidelines. As the lion passes, the tiger suddenly leaps across and pounces on top of the lion, knocking him over onto the ground and going for his throat. 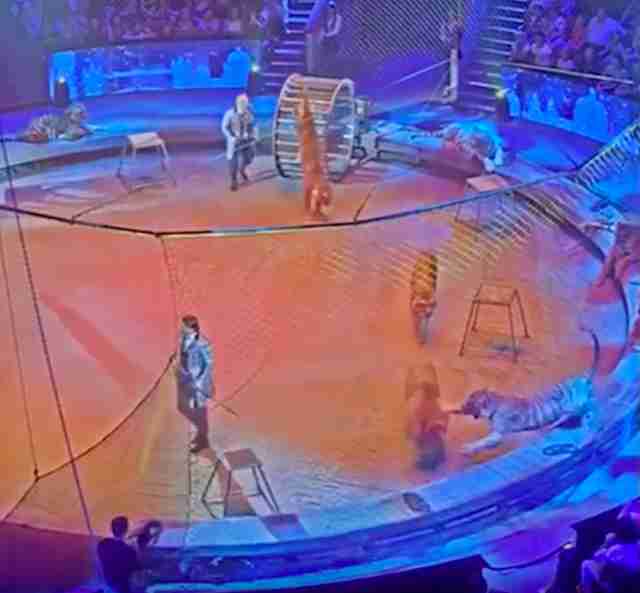 The big cats become locked in an intense fight for several seconds, rolling all over the ring — all while their trainer repeatedly throws metal chairs at them. Another trainer fires a gun in the direction of the cats, causing them to scatter. It isn’t clear whether the animals sustained any injuries from the fight, but the situation reiterates the potentially deadly impacts that circus life can have on big cats. Susan Bass, PR manager for Big Cat Rescue in Florida, wasn’t surprised that such a fight broke out, given the cramped living conditions and cruel training methods common in circuses. The stress of the unnatural lifestyle can often cause the animals to lash out, Bass said. Life at a circus for a big cat is often a mix of loud, booming crowds and terribly tiny holding cages with little to no stimulation. In many cases, as in a recent circus lion rescue in Guatemala by Animal Defenders International, the cats have never even felt grass before. This particular circus in Russia is hosted by the Zapashny brothers, a pair famous for training big cats for use in circuses. Typical performances force lions and tigers to balance on top of large moving wheels and leap through rings of fire. In addition to fights breaking out between exotic animals at circuses, there are recorded incidents where lions, bears and tigers have attacked trainers or even other animals, such as horses. Although the animals are often brutally trained before they’re forced into such unnatural situations at circuses, their wild instincts simply can’t be muffled, Bass said. Tigers, in particular, are very territorial. To help lions and tigers rescued from cruelty, you can make a donation to Big Cat Rescue.